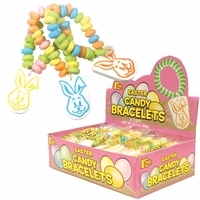 Easter candy bracelets with bunny charms. These are a perfect Easter Basket candy. A stretchable bracelet with pastel disks with a bunny face charm. Kids love candy bracelets and necklaces and these little bracelets with bunny face charm are so adorable. Each bunny bracelet is individually wrapped. 24 bunny bracelets per box.